Didn't pan out last week for an officially sanctioned light lunch excursion. Catching up to be done -- determined to hit 40 reviews for Ipswich -- hence today's outing on, of all days, a Monday. I know. Radical. Maybe we'll form a Monday Club? Ooh, little bit of politics. Easy. 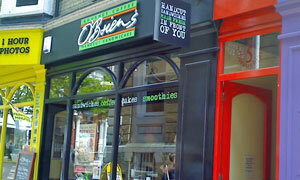 Bike safely moored by Ant & Dec's huge Wii poster outside Debenham's, a 30 second stroll takes us to O'Briens. Sandwiched between Snappy Snaps and a colourful red door -- I can't believe it's not the Buddhist Centre -- is this petite Pret-u-like promising "gourmet coffee and handcut sandwiches". Andy favours taking his soup & sarnie outside: three tables, six seats. Glancing up at the darkness above, I favour sitting inside: three tables, six seats. This time, I win. Now, I didn't see the young lady actually deploy her knife, but it's highly probable that, true to their mantra, she did indeed cut my sandwiches by hand. Tuna and sweetcorn on granary, as fresh as a can of Dulux, with a skimpy dash of crisps on the side. Singular soft drink alert: bottle of Juice Burst Ace, blood orange, c/w vitamins A, C and E. Riboflavin levels undeclared. All good. Nearly all the trade here is takeaway. Plenty more seating round the corner at The Orangery, up at Enjoy, down at Central Canteen, etc. Besides the jackets, there's a bewildering array of fillings, plus a fair few sweet options too. Tempted by one of Kate's (prepacked) Cakes, I'll have a huge choc muffin with a regular Americano (wot no macchiato on the list). Was that a gourmet coffee? Had worse, to be sure. If it was a car -- Honda Jazz. If they were passing by -- Colm Meaney.